Let me tell you a story about the movie Ravenous. I was in high school when this movie came out and the trailer for it was nothing special and I didn’t particularly have an interest in seeing a cannibal story set in the mid-1800s. That being said, just one line from that movie wormed its way into my brain and has stuck with me to this very day. I will still, at incredibly random times, yell out in my goofiest voice “HE WAS LICKING MEEEEEE!” Thank you very much for sitting through that. That has been my Ravenous cool story, bro. The film follows John Boyd (Guy Pierce) as a cowardly soldier that plays dead during the Mexican American War and then gets shipped off to the Californian frontier. He ends up at Fort Spencer, which houses the horror movie equivalent of the F-Troop as every single person there is some kind of weirdo or reject. They find a guy half frozen in the snow that tells them a story about how his caravan was trapped in the mountains and they resorted to cannibalism but he fled once the officer they were with, Colonel Ives, got a little too into the whole eating people thing. So the army’s B team goes to investigate and it turns out that the survivor actually was the crazy officer and that the whole thing was a trap so he could get some fresh meat. This is the point where the movie takes a hard turn into being bonkers. The whole idea behind this movie is the old legend of the wendigo, a Native American tale that said you would become a monster by eating the flesh of other people. So this movie runs with that saying that when you eat people, instead of turning into a literal monster, you get super powers and can heal any wounds. Guy Pierce has to resort to cannibalism at one point in order to survive and that becomes the main focus then in the movie. Colonel Ives wants to have an entire outpost of super cannibals that selectively eat the people that head west looking for gold. Boyd would prefer to not be a goddamn crazy person and sees it as last resort to survive rather than a lifestyle choice. Needless to say, this disagreement gets a little heated towards the end of the movie. 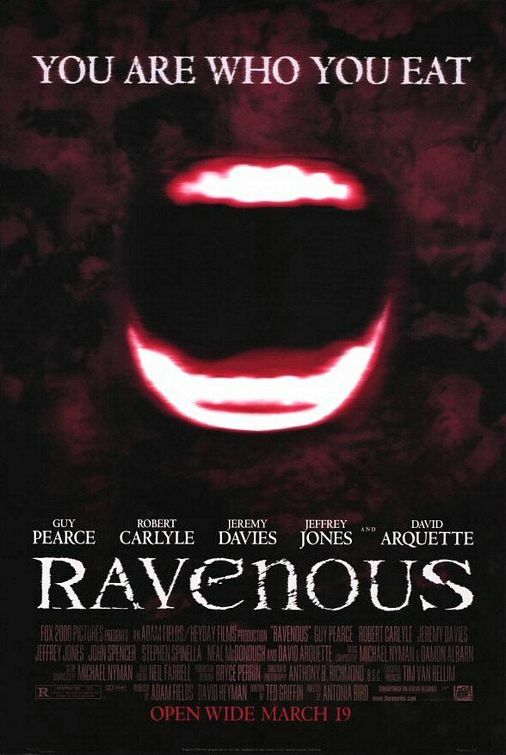 Now, I cannot talk about Ravenous without also talking about the score. The musical choices that a movie uses can alter things in a drastic way. We’ve probably all seen fan edits for trailers where they change the genre of a movie through selective cutting and changing the music. While the movie has a slightly strange plot, the whole eating people and gaining their power thing is well within what you could expect from a horror movie. The score, however, occasionally has a complete tonal shift from what’s happening on the screen. When Ives attacks the soldiers on the rescue mission, he kills most of them and then runs off pursued by the remaining two. The music for this chase scene is what I can only think of as the bluegrass version of Yakety Sax. Additionally, through the movie, there will be these tense scenes and then the background music is a goofy little Casio ditty that sounds like someone hit “demo”. Which would be a hint that the movie wasn’t trying to be serious if it wasn’t for the fact that it also uses much more standard horror fare for the rest of it. As a last note, I’d like to mention Ives is played wonderfully by Robert Carlyle but because I had seen Once Upon a Time before this, all I could think every time he was talking about the powers of cannibalism was “All magic comes at a price” and I can’t even tell whether that ruined it or made it better. Anyway, I give the movie a 4 out of 5. I definitely enjoyed it as much for its weirdness as its actual merits. Favorite part of the movie: HE WAS LICKING MEEEEEEEE! Least favorite part: David Arquette is in this movie and I was going to say more but I’ll just leave it at that. Agreed, that line was great. The movie is so amusing for something that seems to want to be taken seriously.